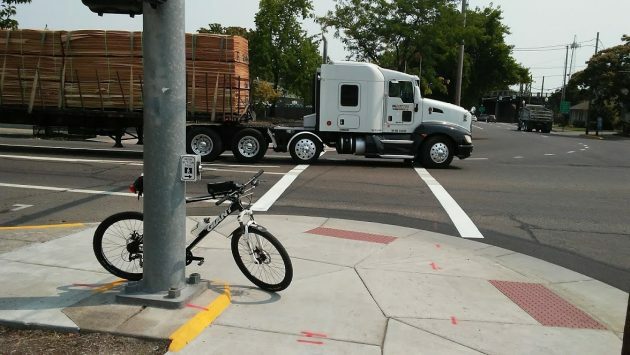 » Fresh crosswalk lines, but why now? Fresh crosswalk lines, but why now? Nice new crosswalk stripes on Ellsworth Street at Ninth Avenue. A reader, Larry Falk, was wondering last week why ODOT was painting crosswalks on Lyon and Ellsworth even though both legs of the downtown Albany couplet of Highway 20 will be repaved next month. Evidently it was a mistake. “Unfortunately,” ODOT Public Information Officer Angela Beers-Seydel responded to my inquiry Tuesday, “it appears that we had an internal miscommunication. Our striping crew was not aware that the streets were going to be repaved in September and so striped the crosswalks as part of regular maintenance. I can say that it doesn’t happen often, but it did happen. Give ODOT’s spokeswoman credit for candor, but if this was a waste of money, it couldn’t have been much. When I took a closer look today, the only crosswalk striping that appeared new was on Ellsworth at Second, Third, Sixth, and Ninth avenues, and at Sixth it was only a partial job. On Lyon Street, the only crosswalk stripes that looked fresh were on the cross streets, which probably aren’t going to be resurfaced any time soon. “Much ado about nothing.” Or should an Investigative Body drill down to extract malfeasance. Let the investigation go where facts lead. My question is, are they going to charge the city twice for their mistake? It’s a state highway, and ODOT doesn’t charge the city for painting stripes. Well done, Falk! An excellent inquiry. S* happens right? Minor mixups. Paint spilled. I suggest you don’t get distracted locally while “WE” are grifted nationally. It’s a mere drop in the bucket of the tax-peasant’s money. This incident reminds one of the continual loop of the Veterans Day Parade played in a speeded-up version because watching and endless loop of the parade in real time might prove too tedious. The City has no business painting stripes on ODOT roads and no business operating a Cable TV channel. Are our City Mothers and Fathers so bogged down in bureaucratic inertia that they no longer communicate with the Higher Power at ODOT? Clear to me on the first read.